Motor Yacht ECLIPSE Launched – Superyachts News, Luxury Yachts, Charter & Yachts for Sale. On the 12 of June 2009 Roman Abramovich’s motor yacht ECLIPSE underwent a preliminary launch at the Blohm & Voss shipyard in Hamburg. The superyacht will undergo further construction and finishing before being delivered to her owner later in the year. The massive displacement superyacht ECLIPSE was designed by Hermidas Atabeyki with interior designs by the very well know designer Terrence Disdale. The mega yacht, which after her launch is now the largest private yacht in the world will have a gross tonnage of around 13,000 tonnes. No public confirmation about the yacht’s size or specific features has as yet been officially made, however, she is understood (but as yet to be confirmed) to measure 170 metres, or slightly less, which would indeed make her the world’s largest yacht in length by around eight meters. She is larger than the UAE royal yacht DUBAI, now second largest, which is just over 162 meters long. The Thyssenkrupp Blohm + Voss shipyard in Hamburg, is a large industrial giant in Germany and the shipbuilder has been understandably tight-lipped about mega yacht ECLIPSE. The yacht was expected to be delivered to her owner Roman Abramovich in late 2009, or accordingy to some reports, sometime in 2010. 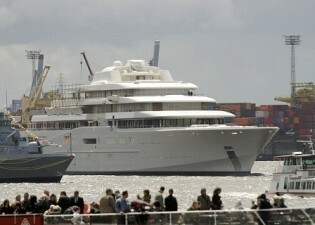 Abramovich’s is now the owner of four motor yachts: Pelorus, Sussurro and Ecstasea and Eclipse. Mr Abramovich used to own “Le Grand Bleu,” however that explorer style mega yacht was presented to his associate and friend, Eugene Shvidler in June of 2006. The rest of his boats measure: the Pelorus (377ft), the Ecstasea ( 282ft) and the Sussurro (161ft). All of these yachts are huge by world terms, and in the top 100 largest yachts, however the Eclipse dwarfs them all. M/Y Eclipse is reported to have at least two helicopter pads, several jacuzzis, a swimming pool, three larger tenders, and a private submarine. There have also been reports about the motor yacht’s various high tech security technology, such as motion sensors, armour plating, and escape sub and a special missile detection defense system. - Built in Hamburg Germany by Blom + Voss. - Naval architecture was by Blom + Voss and Terence Disdale. - Interior design was by Terrence Disdale and Greenline Yacht Interiors. - ECLIPSE was launched in June 2009. - Her construction comenced in in 2006 and her delivery to her new owner will be some time in 2010, taking 4 years to build. - Her Owner’s name Roman Ambramovich. - Owner nationality is Russian, UK. If you have any photos or information on yacht ECLIPSE please post them below. What’s the latest location of M/Y ECLIPSE? Is she still in Denmark? Anyone?